HowStuffWorks is seeking to match its 30,000-plus articles, recipes and reviews with video content, reports AdWeek. The company is collecting advertiser-created instructional videos for the site, which aims to provide one-stop online shopping for all manner of information. HowStuffWorks has already collected more than 1,000 clips, including content from General Electric about wind power, Intercontinental on city tours and Dell explaining how to set up a wireless router. To collect the clips, HowStuffWorks has set up an online upload system for brands to submit their instructional videos. Arnold said the content is screened to weed out sales pitches. Its business model is based on the popularity of Internet search engines as user starting points for navigating the Web. Like the New York Times Co.-owned About.com, HowStuffWorks frequently ranks high on searches for information on topics like HDTV. Both Microsoft and Adobe have announced new video player software as online streaming becomes increasingly prevalent, reports CNET and PaidContent. Microsoft’s new player, dubbed Silverlight, was announced at the National Association of Broadcasters Show in Las Vegas. The announcement also came with the naming of partners, including Major League Baseball and Netflix, who have already shown interest in its use. The software will be able to display web video within a variety of web browsers on Windows PCs or Apple computers. That in-browser display is meant to reclaim marketshare from Adobe’s Flash format, which is used on YouTube and MySpace. Adobe also announced their new Adobe Media Player at the NAB tradeshow. PaidContent reports that this new software will include the ability to go offline with an ad-supported model. It will use RSS delivery to automatically update subscribers with new videos which can then be put on the users’ desktop. The Media Player will reportedly be the only one that can play back Flash-formatted clips. A webcast of Adobe’s announcements at NAB will be available here. Lonely Planet has launched LonelyPlanet.tv, an online community featuring Lonely Planet TV programming, user-generated videos, blogs, forums, ratings, geo-location information and other applications, writes MediaPost. The new site is designed to enable travelers to easily share their own videos and experiences, even while on the road, as well as comment and rate professional and user-generated content. Lonely Planet is offering two main advertising packages: a standard one that includes a banner and skyscraper plus Quigo contextual ads, and a premium package that includes banners and skyscrapers and enables “ownership” of a specific channel or content area. 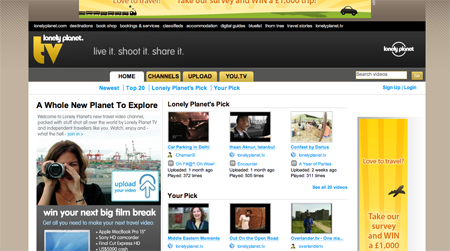 A second sponsorship campaign option enables commercial use of LonelyPlanet.tv, in which a brand can make its own videos available to the site’s audience. MySpace today announced a partnership to debut Prom Queen, a scripted serialized mystery produced by Michael Eisner’s new independent production studio Vuguru, first on MySpace. Each episode will launch on the show’s official profile twelve hours before being released on any other website. Prom Queen, set against the final two months of the high school year, premieres Sunday, April 1, at 7 pm EST on MySpace. This short-form series will unravel over 80 episodes, each running 90 seconds long. The MySpace Video channel and show profile page will spotlight exclusive series content including character profiles, behind-the-scenes video footage, character diaries, and storyline secrets. The Weather Channel has launched Weather Island, a new weather-themed digital destination in virtual world Second Life, reports Media Week. 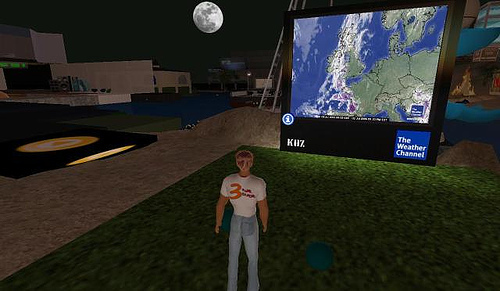 Besides providing simulations of various weather conditions, Weather Island features an extreme sports park for Second Life avatars to play in; they can virtually ski and mountain-bike, and eventually will be able to surf. Second Life residents can also watch video snippets of the cable network’s series on the island, including the recently launched Epic Conditions. Eventually, the island will host premieres of new shows. The Weather Channel’s plan is to eventually open up the virtual island to marketers. Set to launch any day now, Steve Jobs’s Apple TV is touted as a leap in technology linking the internet with the living room – but it may just be a step toward such integration. To retail for $299, Apple TV is “sort of a cross between a Mac Mini, a wireless router, and a set-top box, which couch potatoes can use to connect a big-screen television with a Mac or PC,” writes CNET. The device would allow people to buy content through Apple’s iTunes service to watch on TV. However, the Apple TV is not likely to become the end-all device for the digital living room. Cable providers already offer a slew of on-demand high-definition offerings, but Apple TV won’t support the fullest resolution and iTunes doesn’t offer any movies or TV shows in high def. What the new product may do, however, is replace the DVD player. The convenience and useability of Apple TV and iTunes may give Blockbuster and Netflix a run for their money.